The main components of CNC laser cutter are machine host part, control system, laser, chiller, regulator and so on. Most of the above parts have their own manual or operating instructions, the main machine, structure and composition of the electrical control system will be elaborated here. The machine host part of the laser cutting machine is the most important part of the laser cutting machine. 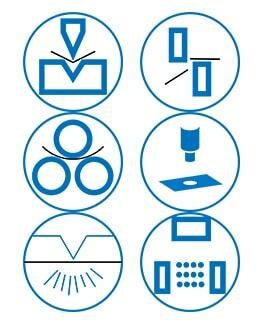 The cutting function and cutting accuracy are achieved by the host part. the bed, laser, gantry part, Z axis device, auxiliary parts of the working table (protective cover, air, and water channel), the operation panel. The electrical control system of the laser cutting machine is the main part to ensure that a variety of graphics trajectory. Generally, the electrical control system mainly composed of the numerical control system and low voltage electrical system. The laser cutting machine is equipped with CYPCUT software, and this system is based on WINDOWS XP operating platform, stable and reliable operation, including 32-bit microprocessor, ethernet communication interface. The system featured fast interpolation operation speed, easy to operate, good dynamic performance, strong load capacity. The control part of the low-voltage electrical system is located in the electric control cabinet, which is the interface part of the electrical control. The components of the electrical part adopt world well-known brand to ensure the stable running and sensitive response. Drive motor is the AC servo motor, which used for driving the X-axis gantry, Y-axis skateboard of the laser cutter. It characterized by good accelerated performance, fast response. The maximum positioning speed is up to 50m / min. 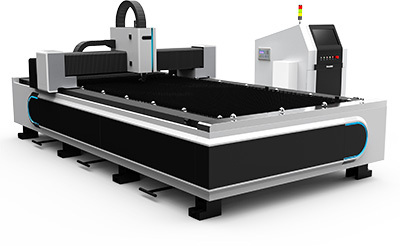 The Z-axis of the laser cutting machine is the feed axis, which uses AC servo motor for driving. The Z-axis cutting head, characterized by the good dynamic response, that is, can be controlled by both servo and NC control. The main part of the machine is the most important part of the whole laser cutting machine. 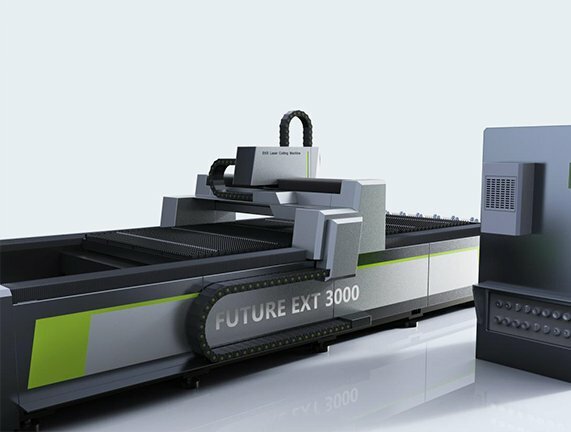 The cutting function and cutting precision of the laser cutting machine is realized by the host part which composed of the bed (Y axis), the beam (X-axis), Z axis, working table, air and water channel. The bed is made of high-strength cast iron with integral welded structure, annealed to eliminate casting stress, vibratory stress relief after roughing → semi-finishing → vibratory stress relief → finishing. Stress reduction is more thorough, reducing the deformation of the machine to ensure that the accuracy for a long time. Through the numerical control system to control the AC servo motor drive, coaxial drive beam to achieve the reciprocating motion of Y-axis, and achieve rapid movement as well as fast feed movement. The movement stroke of 1500mm * 3000mm. Gear rack and linear guide adopt closed dust-proof device, featured lightweight dust cover and reliable operation. Gear rack and linear guide are used precision products, effectively guarantee the accuracy of the drive. Stroke at both ends of the limit switch control, supplemented by both sides of the elastic cushion, effectively ensuring the safety of laser cutting machine’s movement. The beam part is welded with the whole high strength square tube, machining after artificial aging, to ensure the overall rigidity and strength. The processing flow is rough processing → vibration aging → semi-finishing → vibration aging → finishing. The beam is mounted on the support rail of the bed (the guide rail has a linear guide rail and a flat guide rail) and is equipped with high-quality linear guide rails, and servo motor drive gear rotation through the reducer, so that Z-axis skateboard to achieve X-direction reciprocating motion, the movement stroke is 1450mm. During the course of the movement, the limit switch controls the stroke, and there are elastic cushions at both ends to ensure the safety of the system. The upper and both sides of the beam are enclosed by a cover, and a retractable organ guard is provided between the beam and the transverse skateboard to ensure that the rack and the linear guide are operated in a fully enclosed environment without being affected by the external environment. The optical path is partially sealed with an organ shield to achieve a fully enclosed structure of the optical path. Workstations adopt the overall welding structure, with good strength and stability. The exchange table is divided into two parts, which are composed of a switching device and two movable cutting tables. The exchange device is fixed on the back side of the bed, mainly to complete the upper and lower exchange of the two tables. When cutting the workpiece, the other cutting table can be used to feeding and unloading material which will improve the efficiency of the laser cutting machine. Two movable cutting table is composed of a welding frame, above have the workpiece support gate. Two tables can achieve automatic exchange through the chain device drive, greatly improving the production efficiency. The center of the table is equipped with universal ball seat, there are four universal balls in the middle of the table to support 44 workpieces, through the cylinder drive rack and pinion mechanism can swing pole 180 °. Feeding the spiral tube quick connector into the quick connector of the cutting station, open the pneumatic switch, so that the cylinder drive through the rack and pinion. Rotate the swing pole upward 180°, 44 universal balls support the workpiece, the workpiece can roll on the universal ball to avoid the workpiece sliding in the support of the grid, resulting in scratches. When the workpiece positioning, press the pneumatic switch, the cylinder will swing down 180 ° through the rack and pinion mechanism, the universal ball just below the pendulum to avoid the ball was burned during the cutting process. As the workpiece is rolling on the ball in the feeding and positioning, rather than the traditional support (the workpiece sliding on the support grid), this mechanism can effectively protect the smooth workpiece in the feeding and positioning process, reducing the operator’s labor intensity. The Z-axis device is a portion that realizes the lifting movement of the cutting head. The lifting movement of the cutting head is realized by the numerical control system control the servo motor. The motor drives the ball screw to drives the Z-axis skateboard do reciprocating motion up and down. The upper and lower ends adopt the close switch to control stroke, both ends of the ball screw have a flexible cushion to ensure the safety of the movement. Ball screw and linear guide are used high-quality products to ensure the accuracy of the transmission. Z axis can be used as a CNC axis for its separate interpolation movement and can move together with X, Y axis. It can also switch to servo control through the electronic control part of the cutting head to meet the needs of different situations. As the Z-axis servo control is controlled by the CNC system, so the accuracy of the servo control is relatively high and stability is better, thus ensuring the quality of cutting. The cutting head is sealed and resiliently cushioned to ensure the life of the cutting head. The capacitance sensor (mounted on the cutting head) in the Z-axis device detects the distance from the nozzle to the surface of the plate, feeds the signal back to the control system. Then controls the Z-axis motor to drive the cutting head up and down by the controller which will control the distance between the nozzle and plates remain the same and the quality of the cutting is effectively ensured. The cutting head has a nut that adjusts the focal length and adjusts the position of the focus according to the material and thickness of the cutting material, thereby obtaining a good cutting section. the nozzle is one of the wearing parts of the process, the user can spare some nozzle with the different diameter to facilitate the replacement. The electrical control system of CNC laser cutting machine mainly composed of the numerical control system, servo system, and low voltage electrical system. The laser cutting machine composed of CYPCUT CNC system which is based on the WINDOWS XP PC CNC system, with fast interpolation operation speed and easy operation. The servo system uses the Japanese Yaskawa AC servo motor and drive, which is stable, reliable, good dynamic performance and strong load capacity. The front panel of the laser cutting machine has two function buttons, two operation soft keys and two front USB ports (from left to right are emergency stop switch, power switch, cutting start button, cutting stop button). The operating soft keys have different functions in different modes. The operating soft keys can have different functions in different modes of operation, thereby reducing the operation buttons and simplifying the operation panel. In various ways, the operation function is displayed by the menu, making the operation intuitive.